I recently purchased a Freedom 32 (Hoyt). I am very excited to get this beautiful rig in the water, however, before that can happen I need to do a bit of unpleasant business: trucking it home. Has anyone pulled the mast like this? Any advice for a first timer? Does anyone have a ball park estimate of the weight of the mast? Also, if I understand correctly, the mast is sitting on a "top hat" that has an L bracket bolting it in place. The mast collar is friction fit device and is not mechanically connected. Is this true? The drawing makes it look as though the mast collar is part of the mast and needs to be unbolted from the deck (?). In other words, besides the wiring and the L bracket, is there anything else holding the mast down? If it,s like mine then the ring on the deck is holding down a rubber gasket effectively wedged into the hole. Remove ring. Heel of mast may be glued into base, early boats had a lock that required the mast to be rotated. Alloys for UK f33/35 cat ketch weigh 120kg each! Use lots of hitches when securing strong rope. First time you do this will take one day per mast but only 5 mins for the crane. I have a Freedom 32 (Mull), but based on the diagram, believe it is "similar" to mine. As was mentioned by Drew, it does depend on a urethane split ring (with a wedge profile) which is friction fitted at deck level to hold the mast, with the deck mast collar itself in place to secure this wedge. At the base of the mast, my boat also has a threaded rod which sits into a slot in the top hat. This threaded rod does not have to be removed on my boat before the mast pull is started (due to the slot configuration), but does need to be removed prior to completing the lift of the mast as it will not fit through the deck opening. 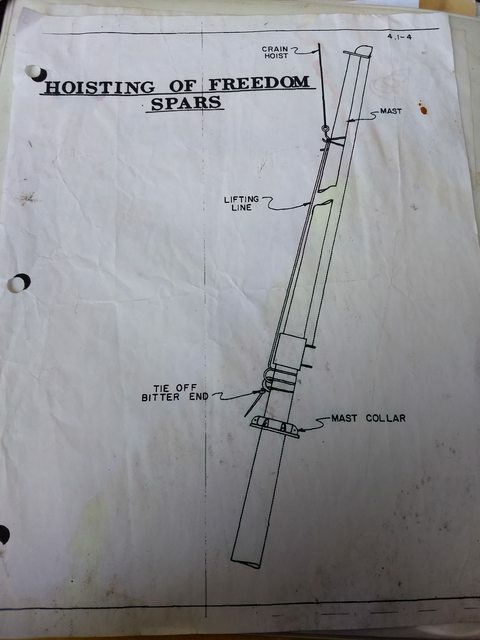 For decommissioning, I unbolt the mast collar and tie it up out of the way (to the vang collar) and the yard crew uses a large screwdriver to work the wedge out, which then frees to mast for lifting, they then lift it a foot or two and then someone below removes the threaded rod, whereupon they complete the lift (the gap at deck level has more then enough room for the mast wiring). Note, the wedge does typically need to be removed before raising the mast (I had one yard think that merely lifting the mast would cause the wedge to "pop out" -- at least this was there thinking until raising the mast cause the boat to start lifting out of the water with no movement of the wedge). My suspicion is that the threaded rod is in place to prevent the mast from rotating -- but given the level of friction exerted by the urethane wedge, I would be doubtful that properly inserted, that the mast could rotate regardless. The commissioning process is largely performed in reverse, with the added task of properly seating the urethane ring (it does need to be largely seated in the gap, for which I use a piece of wood and a sledge -- why make it harder on oneself). On my boat at least, trying to do so by using tightening the bolts on the mast collar will be largely ineffective -- and I strongly suspect that my attempting to do so over a number of years did eventually cause my mast ring (the ring holding the bolts to which the collar is attached) to crack and for the bolts to start turning -- surprisingly (to me at least), the mast ring appears to be a cast part and the bolts are prevented from turning only by the caulk (5200 I suspect) used to bed them and the ring to the deck) -- which is a problem because once seated one will not have any access to the bolt head itself and therefore no way to arrest the bolt from subsequently turning. Many thanks for the detailed information guys. Really appreciate it. I think I have it figured out, we'll find out tomorrow! I also will be looking at unstepping the mast soon. I'll be following this closely. Thanks for all the useful info. 1. Remove boom and all associated lines, disconnect any blocks and lines attached to the mast collar, tie off any disconnected lines coming from the mast ABOVE the goose neck. 2. Remove the 2 pieces of wooden trim around the mast on the ceiling. Mine were held in with a total of 6 wood screws. 3. Remove cabin sole panel around mast and disconnect any electrical work coming out of the mast. 3. Remove the lower bolt/nut on the L bracket (The one bolting it to the keel). Leave the bracket bolted to the mast for now. 4. Remove the nuts holding on the mast collar (by removing the wood trim, you will now have access to these). 6. Rig the spar to be lifted as in the above diagram. I tied a 5/8" line as a choker below the goose neck (as well as quite a few locking knots) and used a 20ft sling (provided by the crane) as another choker to support the upper mast. I then tied the goose neck choker to the sling with a bowline (about 20-25ft long). This worked very well and pulled the mast out vertically, but balanced enough to maneuver it when putting it on the trailer. 7. Lift the mast slowly. It may be a little stuck, but it should now be free. Raise the mast about 3ft. 8. With the mast raised up, you should now have access to remove the L bracket. Mine was held on my 2 nuts and bolts, so carefully (using some sort of blocking to prevent the mast from crushing your arm if the rigging broke) you need to reach inside the hollow mast with a wrench to hold the nut, while loosing the bolt. I also had to push my electrical in to the mast to allow enough clearance to pass through the cabin top. Again, this will change from boat to boat. 9. Lift it out. Everything should now be clear and free. That's about it! Let me know if anyone has any questions. I'd be happy to help. Thanks for the detailed info. I will be doing the same thing next week. Hopefully it goes as smoothly. I have a Freedom 36 and we just had to pull the main mast (May 15 2018) about 5 times to resolve a base issue..
First time was hard/a bit scary since it is big/heavy but now I feel very comfortable with it. We used a Mast Hoist with 5 people pulling to make sure we had it under control. Have drink....the hard part is done.. Seriously, it is straightforward but harder since it is heavy/big..make sure you have enough people. Had my mast pulled on Tuesday at Hop-O-Nose on the Hudson in NY. Great crew. Can't say enough good things about the service I received there. The instructions on this thread were very helpful although Sean, the top guy on the crew, said they had done many Freedoms. All went well with the exception of the way the mast was attached at the foot. There was no "L" bracket, instead there were two bolts through the mast into the "hat" that the mast sits on. One came out easily however the other snapped off on the third turn of the wrench. After much drilling and a few choice words it was free. Everything else went smoothly. Now I'll need to get whats left of the bolt drilled out before re-stepping. It looks like the part that the mast sits on can be removed also which will make the drilling much easier. I'll post pics when I get a chance.